Notebook graphics will be user-replaceable within a year. That's the verdict of Nvidia 's general manager of notebook graphics Rene Haas, speaking at a briefing for journalists in London. Haas went a step further on previous Nvidia statements that have shown the corporation's commitment to producing interchangeable laptop graphics. When pressed on how long it would take to emerge he replied: "I think sometime this year you'll see something". 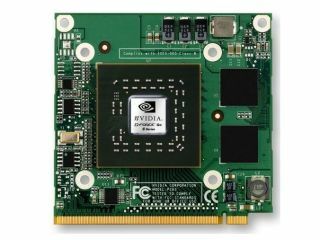 MXM is Nvidia's open standard for transposable notebook graphic card modules - first debuted by the company back in 2004 "MXM leads to later design decisions," Haas said, promoting MXM's appeal for chassis designers. "Down the road we'll see user-interchangeable graphics. Stay tuned." Nvidia unveiled the MXM format back in 2004, when it said it would open the card format up to all manufacturers. It makes laptop graphics cards swappable in exactly the same way that desktop graphics cards are today.